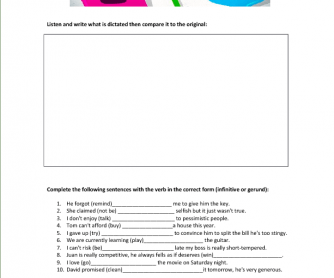 This worksheet is to help learners identify after what verbs we use infinitives and gerunds. It starts of with a dicatagloss, done in teams or individually, about personalities types. After the student is finished writing they compare their version with the orginal. Following this there is a gap fill exercise and then a clarificication table where the students must decide if the verb should go in the infinitive, gerund or either colum of the table. 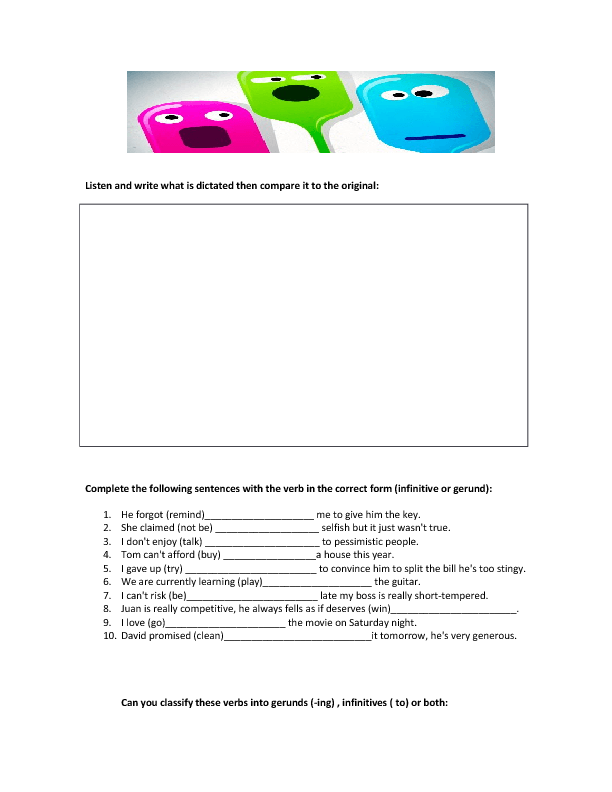 After completing this I would ask students to go back to the orginal dictagloss and underline any verbs that are followed by an infinitive or gerund. Finally, it ends with a speaking section where learners pick a number between 1-4 twice, whatever square they land on the must speak about it for at least 2 minutes.